Christmas in 10 days? Are you kidding me? Tee-hee…Get it, bicycle gears? LOL. Framed bicycle art (with some frame damage) $125. Get it DONE this weekend with us! Make a statement with this FABULOUS abstract, $395, 55×55. Ivory sofa, $450, 78″w. Swivel gliders, $465 ea, 30×33.5×35.5″h. Coffee table, $225, 50x26x18″h. ‘Isabelle’ bookshelf retails for for $1,464, our price $495. 30x13x85″h. Furry pillows, $42 ea. More great looks! Denim blue sofa, $525, 78.5x37x35.5″h. Swivel rockers, brand new $495 ea, 33x30x34″h. Sailboat art, $275, 50×38. White storage trunk, $375, 36x36x19″h. This white dresser won’t last at $295, 62x17x36″h. Bedside table, $145, 24x27x14″h. Beach giclees, $275 ea, 39.5×39.5. Swivel barrel chair, $495, 34x30x32″h. Carved whales, $75 & $55. Lamp, $95, 30″h. The most BEAUTIFUL and vibrant peacock art, a MUST SEE in person. $425, Very large scale, 48×72. Just in, geometric print chairs, $495 ea, 30x33x37″h. Beach art, $195, 53.5×29.5 Woven tray top table, $125, 32 diam x 24h. Planters, $18-$38. Score BIG on this vintage dining set including 4 side & 2 arm chairs, $495. As shown, 72x42x29″h, incl.12″ removable leaf. Wave giclee, $325, 53×35. Fish sculpture, $95, 24×18″h. Another ahh-mazing abstract in on consignment, $395, 73.25×49.75. Blue push back recliners, $400 ea, 30.5×30.5×39.5″h. Solid wood media cabinet, $395, 60x16x27″h. We LOVE the lines on this 54″ round table by Magnolia Home Furniture, and it’s a deal at $495! Lovely pair of neutral egret companions, $245 ea, 26×41. Solid wood media cabinet, $395, 60x16x27″h. 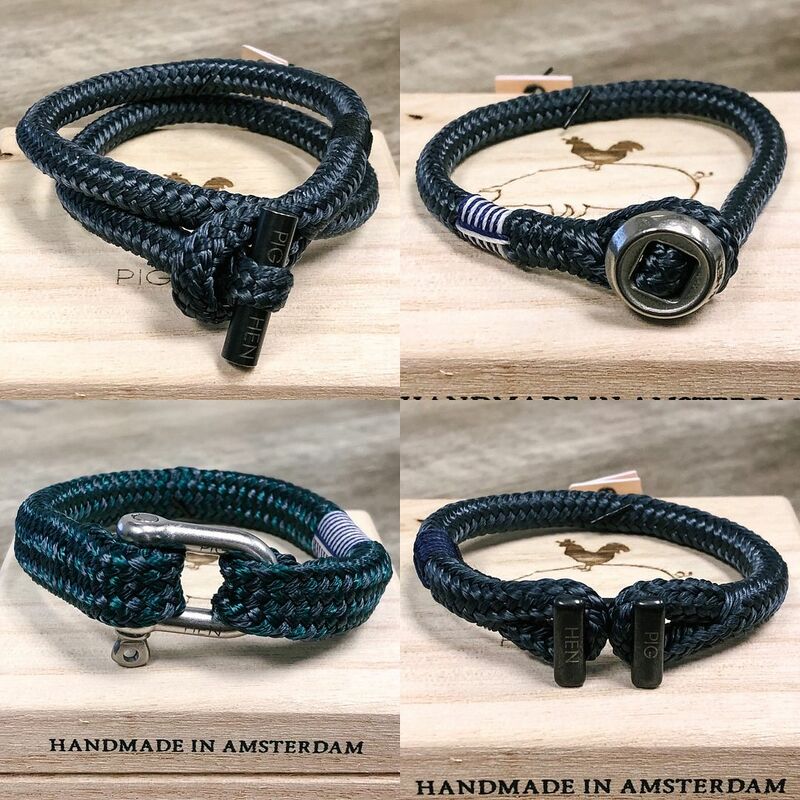 Accessories, $8-28 ea. On consignment, this Norwalk sectional retails $4600, our price $1495. 140x51x36″h. Ottoman retails $760, our price $350. 37x25x17″h. Plaid chair, $450, 30″w. Sea-fern art, $295 ea, 30×54. White fish, $125, 40w. Clockwise, wine corks $5 ea. Putter cork screws $18 ea. Zippered pouches, $10 ea. Gold club bottle openers, $18 ea. Sliding barn door media cabinet, $595, 70x19x35″h. Large hand embellished abstract, $275, 62×42. Resin table lamps, $76 ea, 27″h. Just in on consignment, trestle dining table and 4 chairs with leather trim, a SCORE at $795 for all 5 pieces. 76×45. Accessories, $10-$58. The VERY HOTTEST thing in furniture right now! The most multi-functional table you’ll ever have. Kitchen island, desk, bar, craft-table, casual dining, YOU NAME IT. In solid wood, $595, 72x24x41h (pub height). Stools, $85 ea, 28.5h. Metallic abstract, $145, 52×42. Gold & glass lamps, $145ea, 28h. Accessories, $9-$24. Just received these awesome futons…teal velvet, $425, 76x37x35″h. Blue, $495, 83.5×35.5×33″h. White, $425, 72x37x35.5″h. Just in on consignment and in like-new condition. 48” solid wood dining table retails for $1000+, our price $450. X-back chairs, $95 ea. Life-like eucalyptus stems $22 ea. This is the coolest ‘chofa’…reversible chaise with storage ottoman, $1095. 90.25×64.25×35″h. Zebra pillows, $38 ea. Hmmm…I wonder how many pairs of shoes I could store in this baby! Denim blue tufted storage bench…$245 55x18x18″h. A HUGE & WONDERFUL abstract, $525, 61×61. Ivory sofa by Magnolia Home, $895, 88x38x40”h. Ivory & taupe bench, $175, 50x16x17”h. Accent pillows, $38-$46 ea. The perfect white cedar chest to store those new Christmas toys, $295. Or in my case, shoes and handbags. 🙂 40x17x18.5”h. This rolling bar-height island is FABULOUS. Very roomy, lots of storage, a great work surface and room to gather around. $495 50.25x28x36.5h”h. Two really cool carved wood wall hangings. 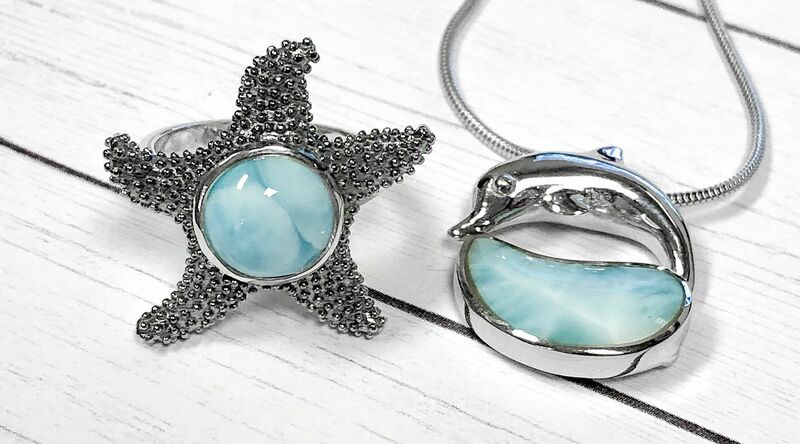 Stunning new rings and diamonds by the yard necklaces! 1.36ct lavender kite sapphire ring, sale price: $2,246. 3.51ct green tourmaline ring, sale price: $2,546. 2.07ct fan Montana sapphire ring, $2,096. 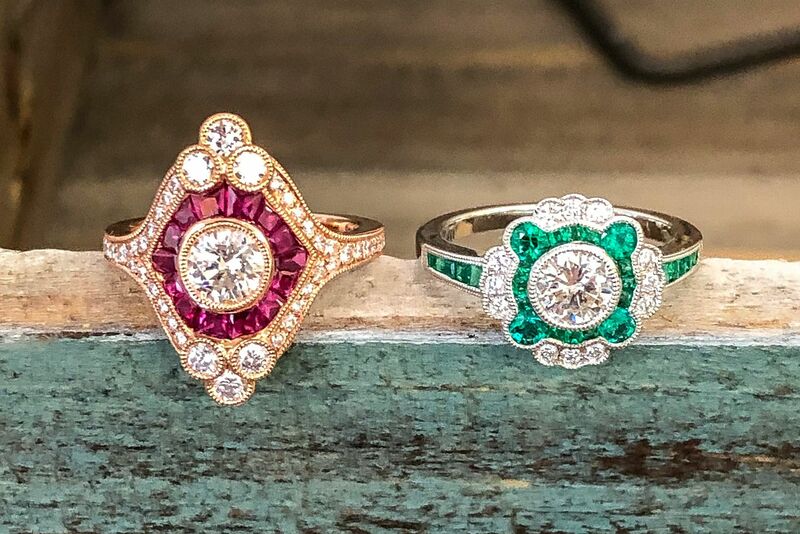 Gorgeous art deco inspired rings! Ruby and diamond ring, sale price: $3,266. Emerald and diamond ring, sale price: $2,749. 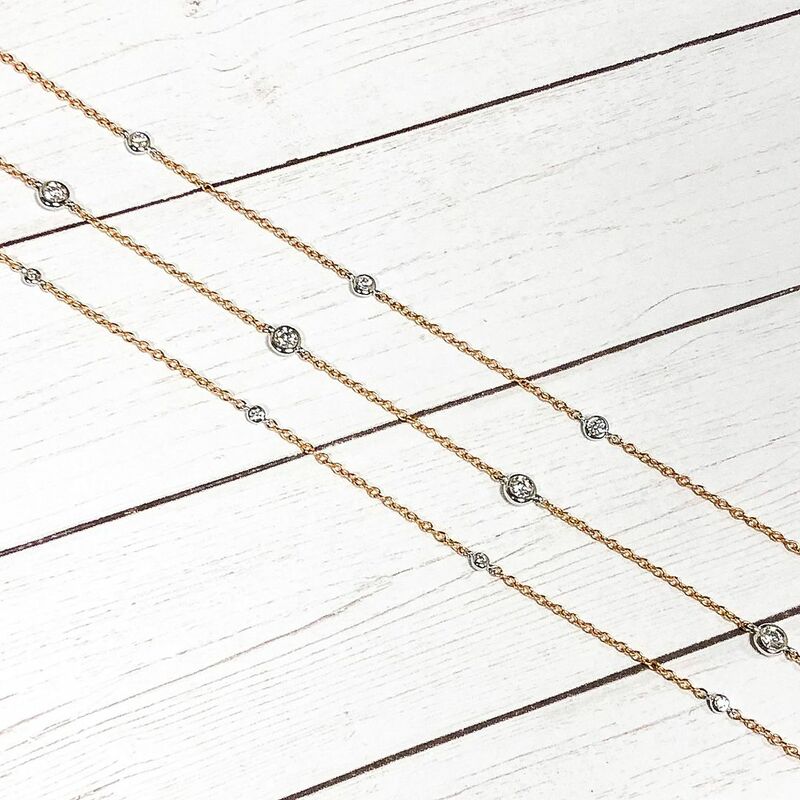 Rose gold diamonds by the yard necklaces. 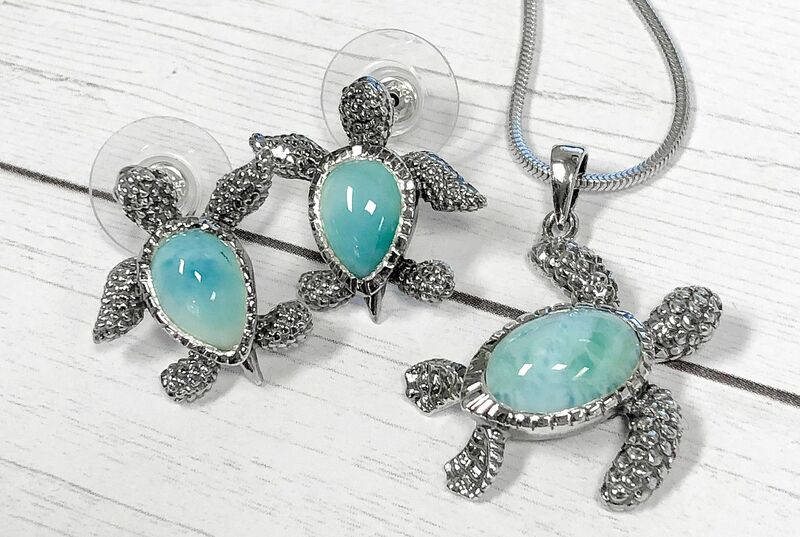 Wear them alone or layer them for a unique look! 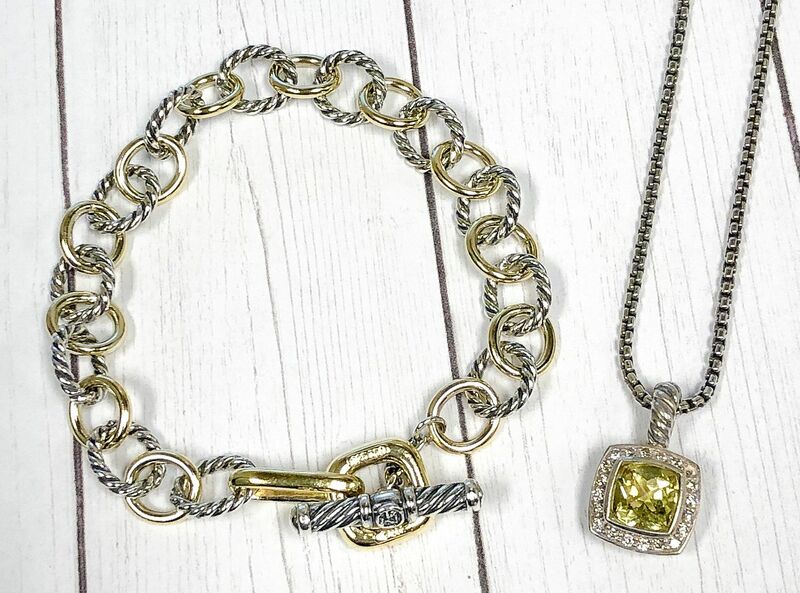 Diamonds by the yard necklaces, sale prices: $855-$3,095. 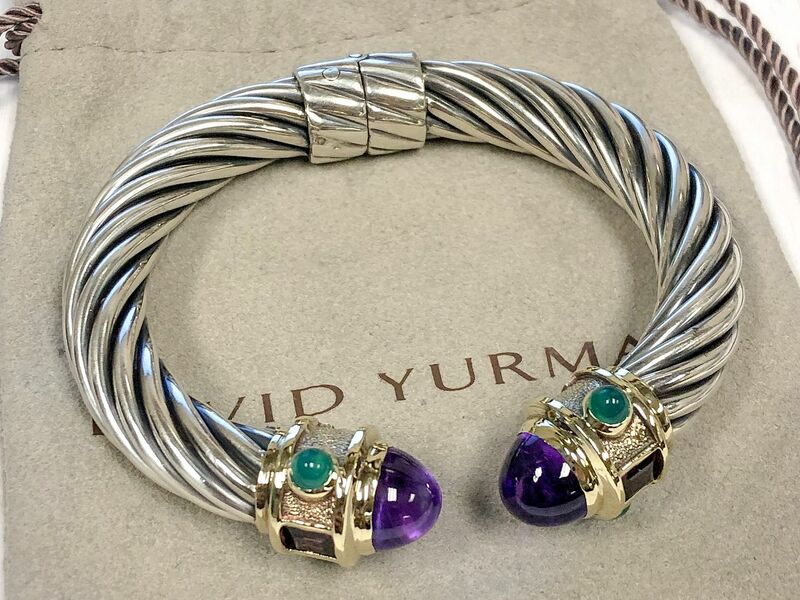 We know you love to receive David Yurman consignments, and these came in right on time. 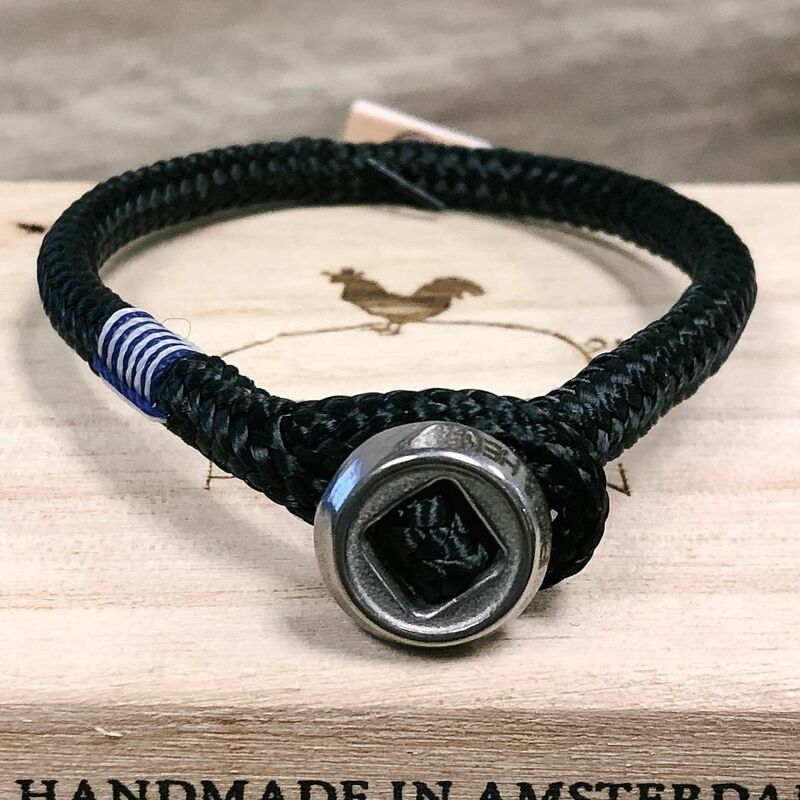 From cuffs to necklaces and more, sale prices: $383-$2,206. 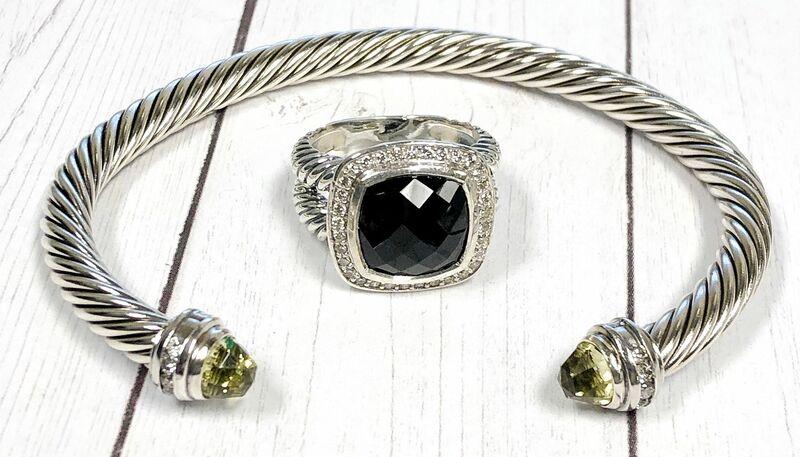 More STUNNING consignments… from designers like Tiffany & Co. and Lucas Roberts. Say yes to a fun fashion ring! Sapphire and diamond ring in 14k yellow gold, sale price: $421. 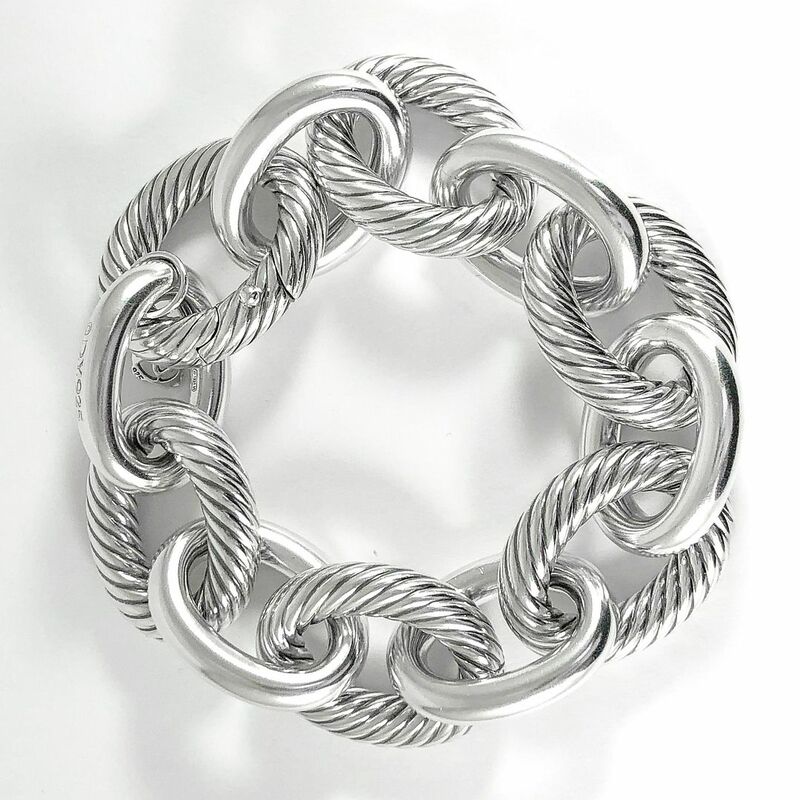 Tiffany & Co. sterling silver ring, $106. Ruby and diamond band in 14k yellow gold, $591. 14k yellow gold hollow 26 inch chain, sale price: $221. Gold plated sterling silver 20 inch chain, sale price: $170. 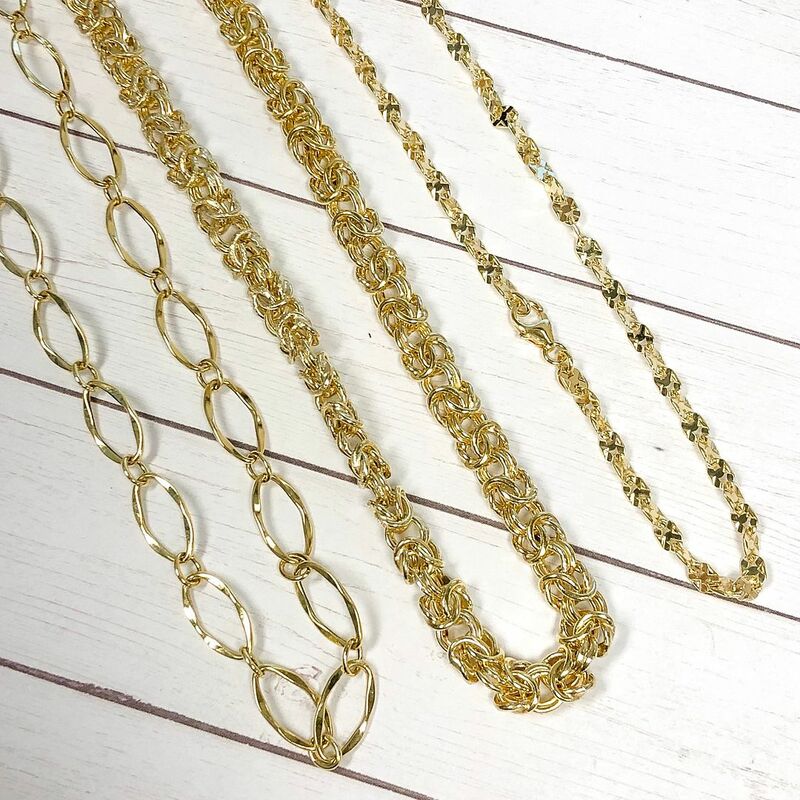 Gold plated sterling silver 36 inch chain, sale price: $170. 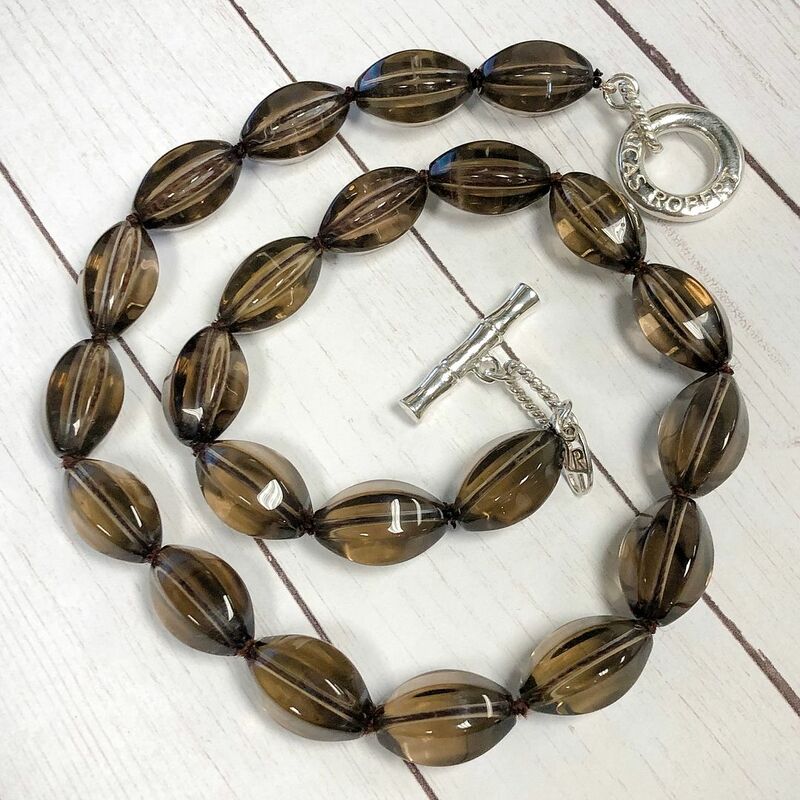 Lucas Robert smoky quartz 17 inch necklace, sale price: $81. 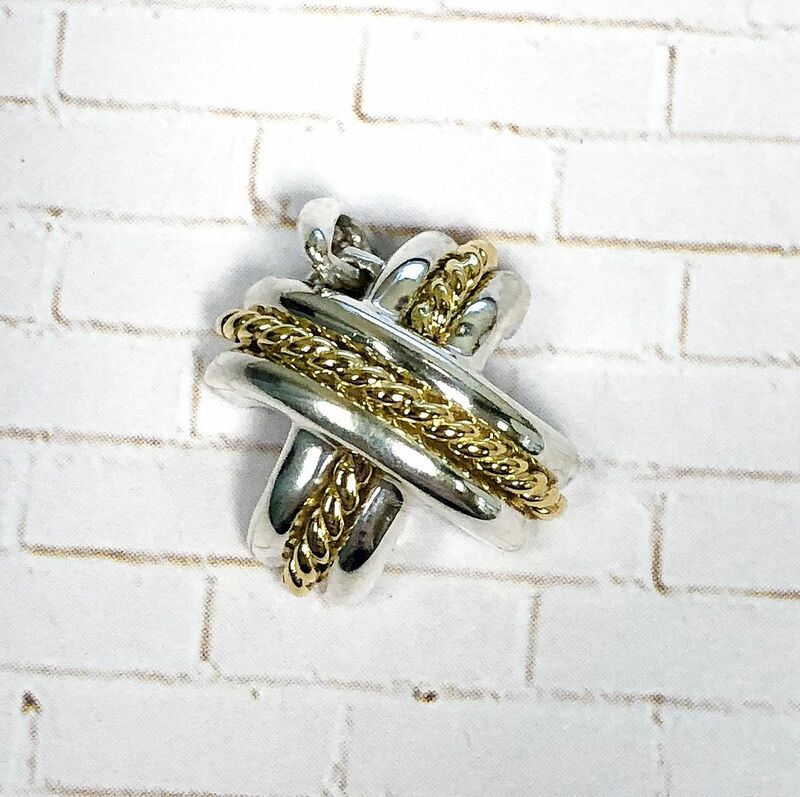 Tiffany & Co. sterling silver and 18k yellow gold X pendant, sale price: $298. 7-7.5mm akoya pearl studs in 14k yellow gold, sale price: 208. 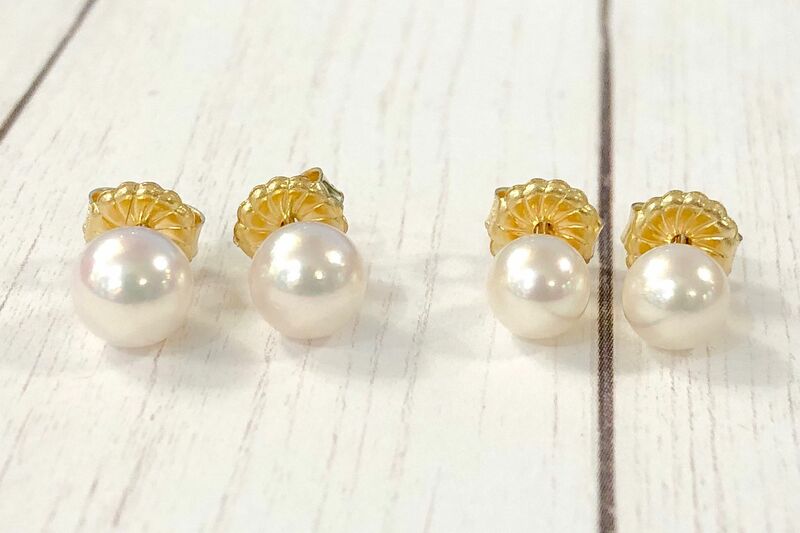 6mm akoya pearl studs in 14k yellow gold, sale price: $149. 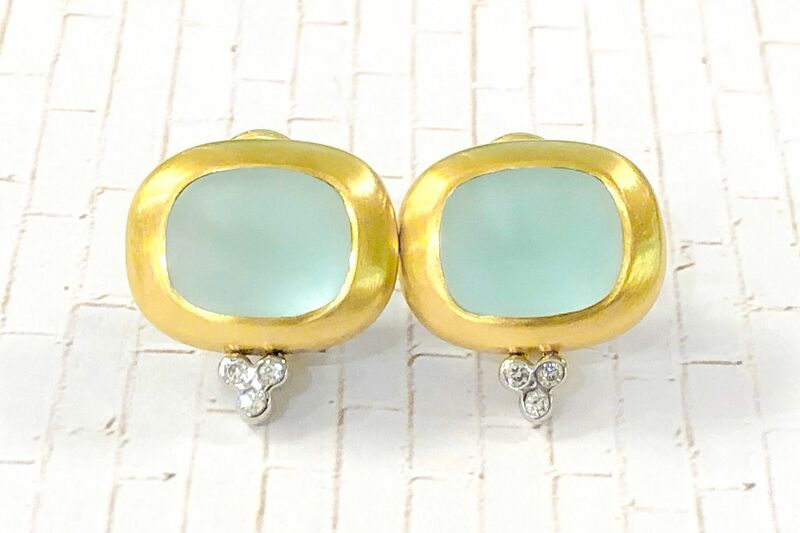 18k yellow gold blue topaz cab and .12ctw diamond earrings, sale price: $1,679. There is something for every budget. Sale prices: $51-$1,441. 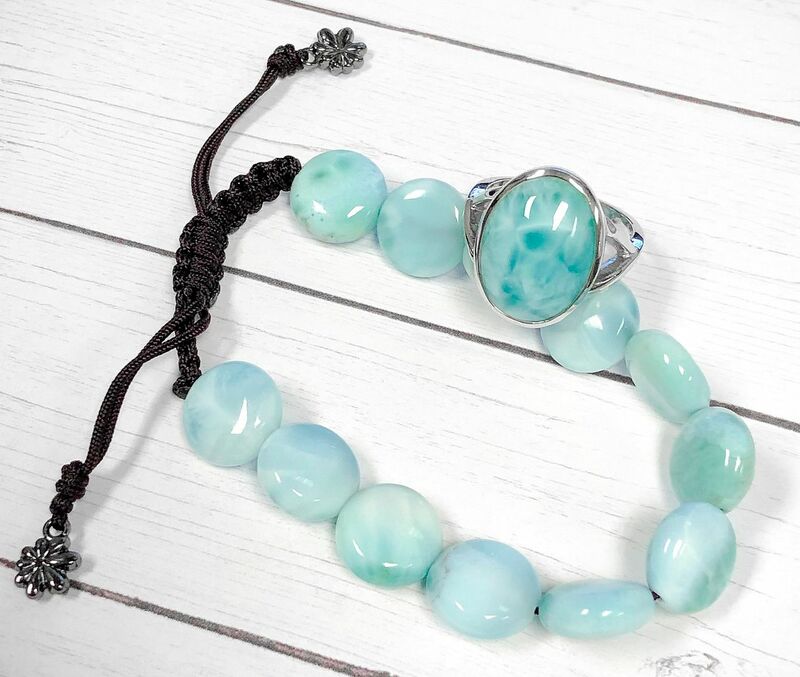 Click the link below to shop the whole Marahlago collection. 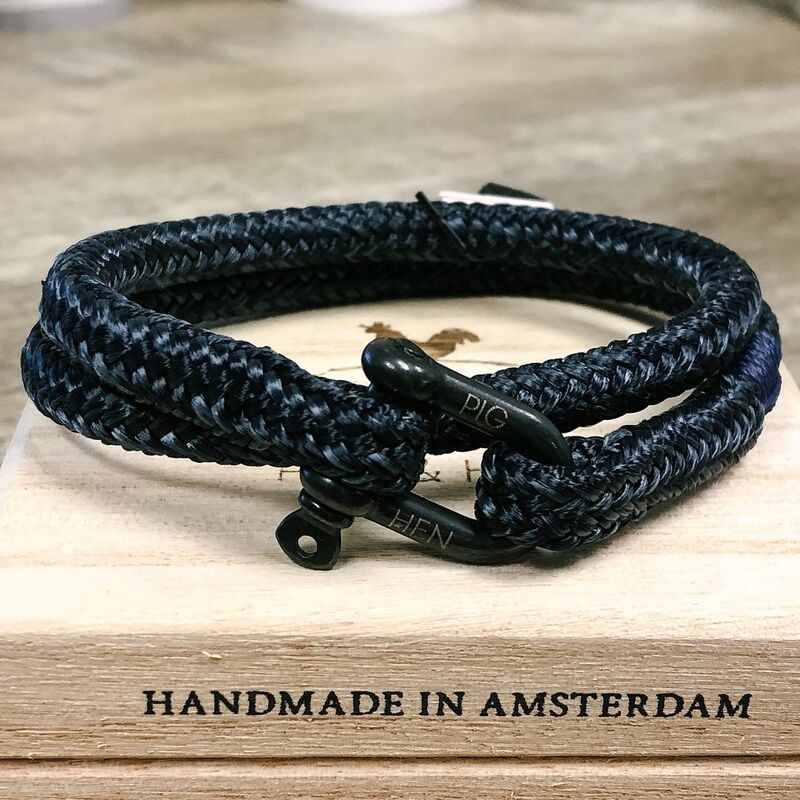 Click the link below to shop more from Pig & Hen! Get it done THIS WEEKEND without breaking a sweat. 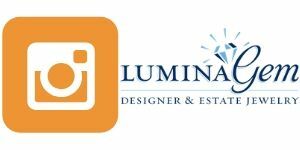 Thanks from your friends at Home Again & Lumina Gem. 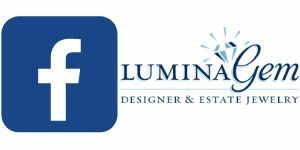 Click the links below to follow our Facebook and Instagram pages to see new arrivals DAILY! 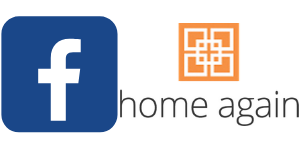 Just remember to LIKE, SHARE, COMMENT, or REVIEW US when you visit our pages. 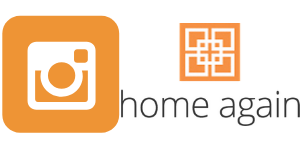 That prompts social media algorithms to actually show you our posts!